The first step in replacing a vapor degreaser is to understand that aqueous degreasing is a different process. Vapor degreasing is primarily a dipping process using effective but highly toxic solvents. The hot solvent cleans by condensing onto cold parts placed within a vapor zone and flash dries as the parts are withdrawn. Aqueous degreasing is a washing process using mild environmentally safe detergents. The parts are washed and then rinsed in hot water. 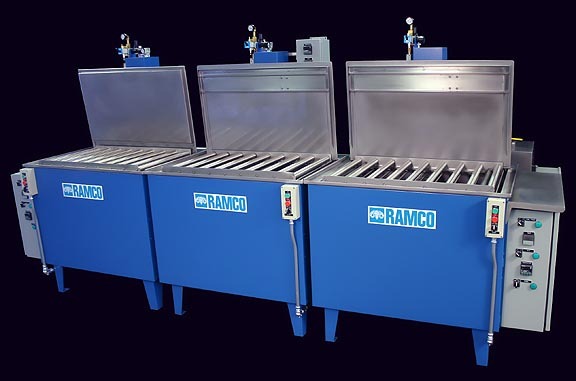 If the parts do not flash dry after rinsing and if the parts must be dry for the next manufacturing process an additional drying stage is required. Platform roller conveyors are included on each elevator to facilitate transfer between stations. Other features such as ultrasonics or automatic transfer are easily added to this basic modular system design.